Pattie has shared how she uses Super Iron Out Rust Stain Remover in her dishwasher, to help remove rust stains. The area in which I live is basically rural. We don't have city water lines in our area. We don't have individual wells. Instead our Homeowners Association has two wells and each of the houses in our area is furnished water from these two wells. Good that we have water - but the water has a high level of Manganese - a type of Iron - in it. The area water pipes have transported this water for so long that it would be almost impossible to rid them of the Manganese residue. Although our water is tested and affirmed to be drinkable, it often has a sulfur smell. What's worse is that all of our household appliances stay stained with an orange coloring. I discovered Iron Out quite by accident while shopping in a local home improvement store. I purchased a bottle and decided to try it first in my dishwasher. My dishwasher was stained a medium-color orange and some of my dishes also have this rust colored stain. To use Iron Out in the dishwasher, first make sure the dishwasher is completely empty. I do occasionally put in a few plates and cups that are badly stained and run them through the cycle with the Iron Out - and then re-wash the dishes. Put approximately 1/2 cup of the Iron Out powder in the dispensing cups of the empty dishwasher. Close the door and start the normal washing cycle. Do not open the dishwasher door while the washing cycle is going. If you open the door before the cycle ends, the odor that emanates is fairly unpleasant. open the door and you have a lovely, clean, un-rusted interior. I now use it to clean my dishwasher about once a month. After using this product in my dishwasher with such great results, I tried it in some of the other ways it also suggests. For example, I have also used it in my clothes washers and toilets, and just about any other appliance that has accumulated rust stains. While I don't like the smell of the Iron Out I do like its cleaning power and I like to have my appliances, etc. clean and fresh looking. Thanks for sharing your uses for Super Iron Out Rust Stain Remover Pattie. I researched this product a bit once you sent me this review, and it sounds very versatile. Like you said, it can be used in appliances, but also to remove rust stains from white laundry (not colored clothing), water softeners, sinks, showers and bathtubs, and even concrete and outside walls. Has anyone else used this product? If so, I would love for you to share your review and uses of it with me. You can share your rust stain removers review here, of this or any other brand, or read other reviews that have already been submitted. Nothing else worked in the toilet bowl of my apartment and it was driving me crazy! Thanks! I want to mention, though, that manganese (chemical symbol "Mn") and iron (chemical symbol "Fe") are two separate elements. Thanks for sharing how it worked for you in your toilet. That's great to know. Several readers have shared how this product helps keep their children's sports uniforms clean. I live in Georgia. My son plays baseball and I am always looking for a new way to get the "red clay" stains out of the white pants. Super Iron Out is the ONLY product that works. I usually soak the pants in the sink with the Iron Out, then wash them as usual. It has never drained the color out of the piping on the side of the baseball pants. It did drain (almost like bleach would) color out of a white shirt that had color on the neck and arms. Lesson learned. It was a cotton shirt so I think that was the problem. The only negative is the smell. It is very bad and gets into your nose and throat. Some parents do the soaking part in a bucket out side. As bad as the smell is, I will still use it because it works. I put 1/2 cup of Super Iron Out in hot water and add my son's baseball pants. It gets them sparkling white without scrubbing or pretreating. This is to get out that orange clay that's on most baseball fields. I've tried tons of other stain removers and pre-treaters. Super Iron Out works the best. Please note it does not get out grass stains. You will have to spray those with oxy or something like that. Thanks so much for sharing this use for the product with me. It does say it is best to use for white clothing, so thanks for the warning about what happens (at least sometimes) when used for colored clothing. I'd love to hear how even more people clean their kids sports uniforms, since this can be such a big issue. Another reviewer has shared how uses Oxiclean for her kids' sports uniforms. You can share your stain remover review here. Super Iron Out is a miracle! My kids participate in a lot of sports and come home with dirty uniforms on a regular basis. The laundry detergent I use is sufficient to get out the dirt and stains but lately, I've been noticing rust spots being left behind. I figured out that my water supply contains a lot of iron, which is causing rust in pipes and other water bearing appliances. I had to find a solution, I couldn't send my kids to their games wearing a uniform that is almost clean. It's embarrassing for them to have bright white uniforms with orange spots in random locations. So I set off an a quest to find a solution to my problem. I started asking the neighbors to see if they were having rust stain problems too. One neighbor swore by Super Iron Out. She told me that she used to have problems with removing rust stains on clothing too and that is was the best rust remover she has ever used. 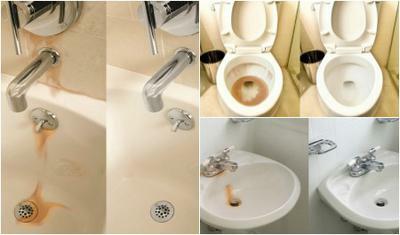 Not only did it get rid of the rust stains in her whites, it also removes rust stains from toilet bowls, tub, and sinks! With her recommendation in mind, I went to the store to buy myself a bottle. When I got home, I gathered up all of the rust stained clothes and did a load with it. Much to my surprise and delight, it worked like a charm! No more orange spots on any of my whites and my kids no longer have to wear white uniforms with orange spots. I would recommend this product to anyone with hard water. It's great to have around the house to remove rust stains just about anywhere they occur. We moved to a rural area 6 years ago. It was an older house with rust stains in the entire tub/shower area along with the toilet, sinks, etc. I seriously tried everything until someone told me about Iron Out. I found the powdered version and it worked great, but couldn't get the stains off the shower walls for some reason and then I found the spray version. The stains literally dripped off the walls. I don't think I could explain my happiness that day. I finally had a clean shower. I always get a little chuckle when I see cleaning tips and people talking about being green and using baking soda, salt and vinegar to scrub out the stains. That's great (I use that for other cleaning purposes), but those people have no idea what high iron content in your water really is. Most of the reviews on this page are of the powder version of this product, which is the original, and what is most commonly seen in stores. There are actually a couple of formulations of this rust stain remover though, and one is the outdoor formula, also sometimes called the exterior formula, which can be used on many areas on the exterior of your home. It is a liquid product, not a powder, and is ready to use (meaning it is not concentrated). 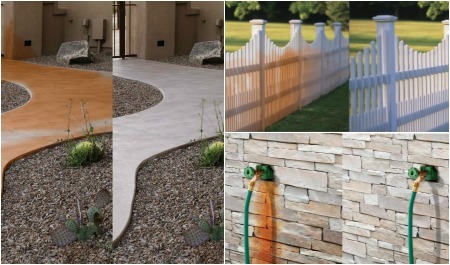 An advantage of this version of the product is that it is safe for use close to vegetation, which can always be a concern with products used for cleaning rust off things like exterior walls, sidewalks, driveways, decks, patios, and fencing. Please note that this version is specifically not recommended for use in appliances. Therefore, use the original version for things inside, and this exterior version for outside! Has anyone used this product for their concrete surfaces? If so, I'd love to hear your concrete cleaners reviews or read others that have already been submitted. Alexis has also provided a review of this product, and this one shares even more uses for it for removing rust stains from things. My untreated well water has iron in it and leaves orange stains on laundry and bathroom fixtures. This product is very useful, but unpleasant to use. It has a terrible smell and a very fine powdery texture which gets airborne briefly when you pour into your washer. Because of this I store it in the garage, not under the sink. Super Iron Out works well for hard surfaces and white towels (I do a long soaking). However, it will permanently and severely damage colored fabrics. I have not found a way to get these stains out of colored fabric. I usually run a second rinse cycle on loads treated with Iron Out. By the way, Clorox type bleach makes rust/iron stains on fabric much worse; Oxy wash type products maybe lighten rust stains slightly but do not remove them. I scrub my toilet bowl about twice a week with regular Lysol chemical type cleaner to keep up with iron stains and then use the Iron Out infrequently. I've tried the more eco-friendly cleaning products for toilet cleaner and they don't work well on the iron stains and went back to Lysol. Finally, here are my tips for shopping for this product. If you can't find it in the grocery store stain products aisle, look at Walmart or in the Home Depot plumbing department. Thanks Alexis for sharing this review with me. I really appreciate it. Now that I know more about this product, I have actually noticed it in more locations, including in my grocery store on the cleaning and laundry aisle, along with at the Walmart like you mentioned. In addition, it is available through the link below from Amazon.com. 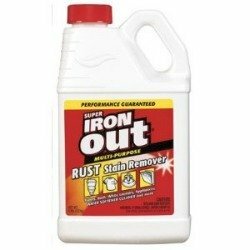 I would love for more people to share their uses and opinions about Super Iron Out, since it's a very versatile rust stain remover for lots of different things in your home. You can share your own review here, of this product or any other rust stain remover you have used (and also read other reviews already submitted). Whoever decided baseball pants should be white and the clay red was definitely not considering the laundry! 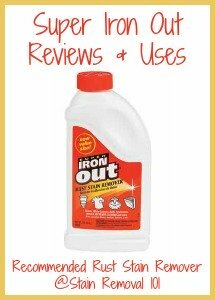 Iron Out is the best thing I have found for cleaning white pants with no orange residue! It smells pretty bad during the cleaning process, but works fantastically!! I have soaked our rust/manganese stained (on the edges) dishes in Iron Out and they came out like new. can it be used in a plastic pool? Can this be used in a large plastic pool that has well water that has metals in it? I have 2 pairs of white converse. One pair I tried washing by hand with laundry soap and they turned a dingy yellow. The 2nd pair got very muddy one day so they too got washed with laundry soap. They are quite dingy. Do you recommend soaking them in Super Iron out to try and get them white again, or should I use the White Brite product? Also was thinking of trying the OxyClean White Revive. I have read good and bad reviews about all 3 of these products. I just want to get my shoes white again.. P.S, Baking soda and peroxide paste does not work. Saw it on the internet and tried it. Big fail. Our hydrants were flushed with no warning resulting in rust stains on brand new white towels. A couple of washes later [following directions] and the stains were gone. However, it left an odor which I cannot remove completely. I have tried a vinegar wash and baking soda in the rinse. I have also used a strong smelling fabric softener. After 3-4 washes there is still a lingering "iron out odor". Any helpful hints would be appreciated. Container with dried out Super Iron Out??? 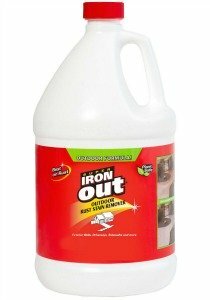 How can I re-liquefy a large container of Super Iron Out? It is a solid block. Is it water soluble? Something else? Iron Out does work extremely well but it must be used in a well ventilated area and not to be used by people with breathing disorders. If you put Iron Out in the toilet bowl tank it will remove all the stains and will help with keeping the toilet bowl looking better longer. Can you use iron out on fiberglass shower enclosures? How do you keep it on the walls of the shower long enough for it to remove the rust? Thanks for any help!